Apocynthion is an amazing new atmospheric post black metal band from Madrid, Spain that only recently released its first work. The band was formed in 2010 and took its name from the astronomic term “apocynthion”, which describes the point in a satellite’s lunar orbit that is farthest from the moon. They had released only the digital single “Correlations” in March 2012, before they finally sign to the Chinese label Pest Productions and release their debut full-length album “Sidereus Nuncius” on April 17th 2013. From the first moments of this album, it’s clear we have to do with a really good work. Apocynthion convinced me that they take seriously themselves and work with professionalism on every detail of their album. “Sidereus Nuncius” is a long and complex album, whose 7 songs last for almost an hour. The band has a very experimental mood, combining atmospheric black metal, post metal, post rock, shoegaze and ambient music. 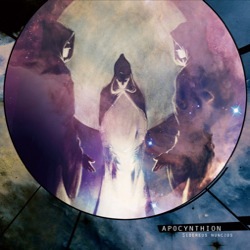 There are many bands nowadays that try to play in this style, but Apocynthion have done an amazing work, creating a very atmospheric, variable, interesting and above all beautiful album. The band moves really fluently in its long compositions between all these genres and different moods, being equally good in all of them. They prove that they don’t experiment just for the shake of experimentation, but they are capable of creating a very solid and enchanting work. Melancholy, depression, awe, longing, hope and warmth; all coexist magically. Their singer and guitarist W. has a great voice, utilizing a wide range of black metal screams and clean vocals, following the various emotional changes of their compositions. Unlike what someone might expect for this genre, synths are very discreet, leaving plenty of space to the “typical” metal instruments. Their brilliant guitars are used in so many different ways, creating unique soundscapes, accompanied by beautiful bass lines and innovative drums. Lyrically, Apocynthion speak about cosmic, space and astronomic themes in parallel with mankind’s metaphysical searches. The majority of their lyrics are in English, while there are a few verses in French and Spanish. “Sidereus Nuncius” is a really impressive debut album, with great technical sound and wonderful production. I totally recommend Apocynthion to fans of post black metal; you should at least check them. Pest Productions released ”Sidereus Nuncius” on CD with a very beautiful package, matching the quality of its music. It comes as a limited to 500 copies 6-panel digisleeve, including a 12-page booklet with all the lyrics. The amazing artwork and design is by Fursy Teyssier (Amesoeurs / Les Discrets). I strongly advice you to visit their official pages below and discover their music.